The Park Street school sat where the Children's Park now sits. These buildings always look so grand in the photos, but I suspect we would be less impressed if it survived to present day. I went to third and fourth grade there back in the early 60s. It was still there in the 60's? When was it demolished? 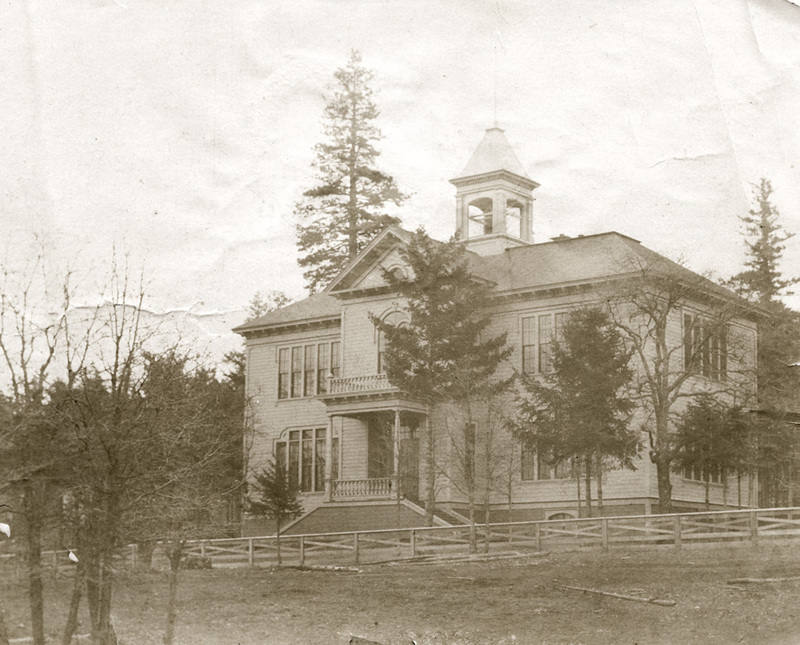 Yes, the photo does look grand, but Hood River had and still has some grand looking schools. I suppose it was cold in the winter and hot in the early September days of school. This must be an early school, the Park Street school I went to in the fifties was Masonry. The only wide views we have of the Park Street School are of this wood building. I see a couple of tight views of kids in a doorway in 1915, and it is a brick building. The Glacier reported on construction of the "new Park Street School" in December 1920, so apparently those dates were off a little. Now, do any of you have pictures of the brick Park Street School? I can't find any in our 543 pictures of HR schools. My most vivid memories of Park Street School was Principal Chipley making us line up by grade outside before school in the morning. He must have been a drill sergeant in the Marines! I don't have a picture of the whole school just one of our 4th grade class on the front steps. Yes Arlen, you are standing right in front of Mrs. Vernon. Arlen, do you remember her multiplication drills? Oh my, I had Mrs. Vernon as a teacher too. Liked her! I remember a brick school building, the cafeteria serving slimy okra for lunch, waiting in line for inoculations, meeting Nancy Wesche for the first time after her family moved to Hood River. Lots of memories. Did first and second graders walk from Coe Primary to PSS for hot lunch, or are some of my memories faulty? And, yes, I was in the same 4th grade class with Arlen and Norma in 1950-51. Bea Vernon was my all-time favorite teacher and I actually enjoyed the multiplication drills. My favorite recess time and lunch hour activity was playing marbles for keeps. A little trivia. Did you know that Bea Vernon was the sister of the woman who donated the land for Jackson Park, Vilate Jackson? I really enjoyed the article on the history of the park in yesterday's Hood River News! And if you're looking for old pictures of local schools, check with Ed Walston, retired custodian of May Street School. He's amazing! We lived just down the hill from Park Street school. I remember playing low height basketball in the gym on the south, and marbles under the trees on the north. I still have all my marbles! Park St. School was a brick building in the late 40's. Mrs. Finney was principal then and one of my main memories was Mrs. Clark who kept tubs soaking reeds around edge of room and we all made baskets during snowed in recesses and lunch times. and my grandson still plays it. The building was totally subject to a fire that would have been horrible. It was demolished for this reason. The City Fire Dept. recommended it's demise. Many people feel that the flat area east of the rest room should have a rock with a plaque on it reflecting the history of this very contributing school. The stairs on the Hazel St. side were the north entrance to the school. Thanks everyone for the memories. I enjoy reading them. And I am so glad Jeffrey still has all his marbles. Many schools no longer allow playing for marbles, nor promote memorizing multiplication tables. I wonder what those kids will have for memories sixty years from now? I will have to check out the stairs on Hazel Street. Concerning "playing for marbles"-- one of the treasures we recently found in a school district archive is a letter from the superintendent in the 1920s explaining the discipline problems he deals with, and "playing for keeps" was definitely frowned upon in that era as an element of delinquency. Bill, apparently, was a delinquent. I will testify that Bill is in fact a delinquent.....and he very probably has retained the evidence of his ill gotten marbles....some of us have lost our "marbles". The picture is of "the old Park Stret School" . The new one was built about 1910 of brick and was closed about 1971( and burned shortly thereafter). " The 'great migration" movement of children to May Street (grades k-6), Hr Middle School grades 7-8 and the new High School allowed all the upper grades move to that building The realignment was completd when kindergartens were introduced, requiring an u9pward nudge to make room for them to the present configuratioon. Ahhh, the good old days. I remember principal Chipley. I seem to remember that after a heavy snowfall that the principal fell through the roof of the outdoor basketball court while doing snow removal. How fun it was to sled down the playground after school hours - but I admit to getting my tongue stuck to the monkey bars once when it was frozen! PS I believe Miss Shinsato is Japanese-American. I think she was born in Hawaii. The only reason I think this is because she and my Mom (who taught third grade at Dee) had a cultural exchange day. We (Park Street kids) traveled to Dee where’s few of us did the hula and my Moms’ class did western dancing. We also had her over for dinner one night. I thought she was really cool!